Although I really want to start making some hearty fall meals and to start spending a bit more time in the kitchen as we get further into September, the weather is just not cooperating with my plans! We live in Chicago and are having some abnormally super hot weather with high 80s/low 90s this week, so I’m trying to not use our oven a crazy amount just to keep our house cooler. Lots of slow cooker action and grilling going on over here this week! Also keep in mind that I’m by no means a food blogger, a recipe creator, or even someone who eats super healthy all the time. Just a Mom trying to feed her family something decently nutritious and enjoyable to eat for dinner. So just keep that in mind if you see weird combinations of things on here or random sides of steamed veggies, haha! I’m sure some of these meals might end up being made on a different night than we planned based on what we’re in the mood to eat, but this is my loose meal plan for our dinners this week…. Planning on trying out this recipe for the first time, hoping they turn out good! Another new recipe for the week – using this one. This day is extra crazy so we definitely needed a slow cooker meal on the menu to avoid getting fast food. Little Miss has preschool in the morning and basketball late afternoon, Little Man has his 1-year-old well visit (cue me sobbing because I don’t have a baby in the house anymore! ), and then I also have a work-related meeting this day. We celebrated our little guy’s 1st birthday with our families last weekend and had leftovers from that dinner that we ended up freezing, so I’ll just pull these out of the freezer and put into the fridge on Wednesday night and then reheat in oven. And probably pull a random veggie like peas or something out of the freezer to round out the meal a bit more. We like this chili recipe, but I omit the jalapeno peppers and add red pepper instead so it’s not too spicy for the kids. I’m also planning on trying out this margarita recipe for fun drinks for the hubby and I to enjoy together after the kids are in bed! My husband is surprising me and made the reservations for our special anniversary date night, so I’m super excited! It’s hard to believe we’ve been married for 5 years and together for 11……time truly flies! Now it’s your turn – what are you planning on making for dinners this week? Did you get your meal planner yet? I offer a free meal planning printable pack for subscribers that includes a weekly meal planner and organized grocery list, so be sure to download it for free below if you haven’t already to help you with your meal planning! Simplify weeknight meals with this free printable pack that includes a meal planner, grocery list, and favorite weeknight meals list! You're almost done! Check your email to grab your free meal planning printables. Sounds delicious! We had tacos yesterday and pizza today. Tomorrow we are going to have chicken parmesan and Thursday we are going to have Tuna Casserole. This is probably the best week I’ve had in awhile for meal planning. I’ve been out of practice lately. Thanks for sharing! Nice meal plan! Happy anniversary 🙂 Any tips for a happy marriage? 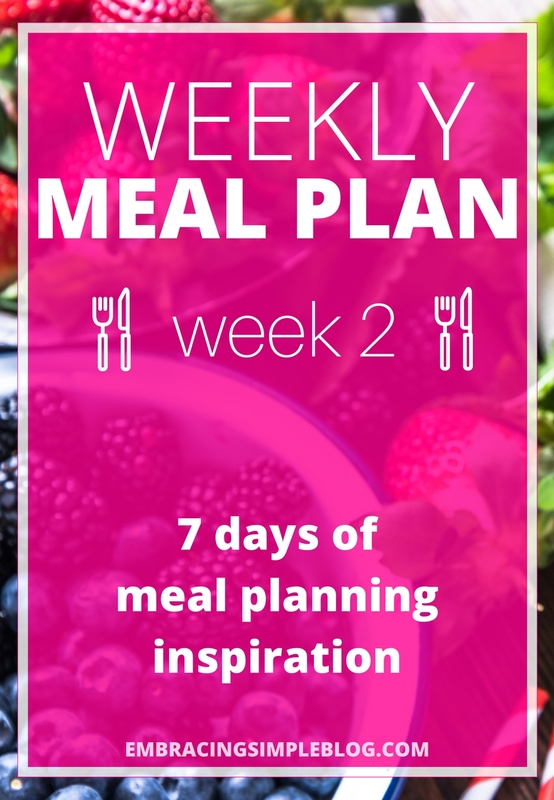 This looks great – definitely inspiring me to do a meal plan myself! Christina, both of us majorly fell off the blogging wagon. 😉 Ha. I hadn’t checked your blog for a while (a few months I would say) and just checking in now. I was hoping at least one of us kept going. I guess life is as busy in Chicago as it is in NYC. And of course babies get in a way too 👶👶😄😄.